Fate of the Budayeen: Let’s kick this off! A few days ago I posted a little poll to see which setting people would be interested in seeing used in a step-by-step example of creating a setting in the Fate Accelerated Edition (FAE) role-playing game system, all the way from initial Light Bulb! moment when an idea grabs you to prep notes for a game. I just closed the poll, and it looks like the Budayeen setting, from George Alec Effinger’s “Marîd Audran” series, won the poll. That suits me fine because, as Fred Hicks pointed out, too many people still think FAE is just for whimsical or light-hearted games. I am convinced that FAE can be successfully used for any setting which the more detailed Fate Core can power. My ambition is to convince readers that it’s quite easy and they can do it with modest effort. Just to be clear, I will be putting in way more effort than I normally have to, because I want to write clear posts giving you context — which means way more legible than my typical game notes! For those who have not read the books, I will throw in a little background. George Alec Effinger (1947-2002) was a talented science fiction author whose work, while it was well-regarded, never quite got the appreciation I think it deserves. I’ve written a little bit about his novels When Gravity Fails, a Fire in the Sun, and The Exile Kiss, and his posthumous short story collection Budayeen Nights, and about Effinger’s writing style in a previous post on some of my favourite cyberpunk book. The three novels were also repackaged as an omnibus edition and released in hardcover and e-book formats a couple of years ago as The Audran Sequence. The setting of these hard-boiled cyberpunk tales is the Budayeen, the entertainment quarter of an unnamed city of the Middle East, and the main protagonist is small-time hustler-turned-fixer Marîd Audran. The model for the Budayeen and its denizens, however, was Effinger’s beloved French Quarter district in New Orleans. As the talented, dedicated writer he was, Effinger didn’t just slap a paint coat and a soundtrack on his borrowed backdrop, however; he did serious research into what it should look like if it really had evolved in an Arab metropolis. Back in 1992, R. Talsorian Games published a supplement for the RPG Cyberpunk 2020 also entitled When Gravity Fails, which used material from the three novels and was personally reviewed and approved for publication by Effinger. Spoilers? I would hate to give spoilers to the entire series for those who have not read it, however, so I will set my game in an undefined period shortly before the start of the original novel When Gravity Fails. I plan on basing my notes on about what you’d get from reading the first five chapters, about 60 pages; plus any non-spoiler material from the subsequent chapters and books (e.g., names of characters and places that would have been around at this time). Although I have the R. Talsorian supplement, I think I will not use it much because it’s more difficult to get access to. I want to show what happens when a GM falls in love with a setting and wants to turn it into a game with minimum fuss and expense. The hard-boiled detective fiction of Raymond Chandler, Dashiell Hammett, etc. Frank Miller’s Sin City, both the graphic novels and the movie produced and directed by Robert Rodriguez and Miller. Casablanca, the immortal movie directed by Michael Curtiz. Neuromancer and other stories of The Sprawl by William Gibson. Blade Runner: The Director’s Cut, directed by Ridley Scott. Photos and maps of large Islamic and Middle Eastern cities like Dubai, Riyadh, Doha, Djibouti, Kuwait City, Manama, etc. especially images of night life, slums, markets, or the old quarters. As I remember or discover interesting tibdits that could be adapted to this game, I save them as bookmarks or documents in an Inspirations folder. A lot of this will serve only to keep me in the right mind set as I prepare, and to explain to my players what I have in mind when we actually create our game setting proper. Edit: Here are links to all the parts of Fate of the Budayeen. Let’s Kick This Off! (this post). Step 1 — Gather inspirations. Establishing Foundations. Step 2 — What is the “feel” of the setting and campaign? Crunchy Bits. Step 3 — Adjust the rules to the setting. Faces and Places. Step 4 — Known characters and locations. Mise en Place. Step 5 — Preparing to improvise. Putting It All Together. Step 6 — Fine-tuning and running the game. FAE or Fate Core? Comparing the two baseline builds of the Fate system, Fate Core and Fate Accelerated. Approaching Fate Accelerated: More Crunchy Bits — When a Fate Accelerated adaptation might use elements from another game system. Fate Accelerated: Aspect vs. Approach — The difference between aspects and approaches in Fate Accelerated. Fate-full Lessons: Gaming Notes — Best practices in running Fate games in any build of the system. Fate, Difference and Advantages: The statistical difference between character skill or approach ratings, and the tools Fate gives to overcome it. 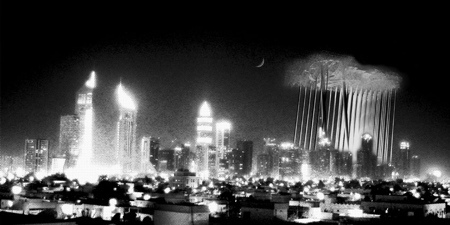 Notes: Illustration is from Nadim Karam’s resort-in-the-sky concept (“rain cloud” building on the right) presented at the 2007 International Design Forum in Dubai. Source: Gadling. Used without permission, no copyright challenge intended. Posted on August 27, 2013 November 18, 2013 by mechanteanemonePosted in fiction, games, rpgsTagged books, Budayeen, cyberpunk, e-books, FATE, Fate Accelerated, fiction, games, george alec effinger, how-to, resources, rpgs, scifi, writing.